Finishing up on the topic of CMOS bus logic I am going to show a couple of families with unique properties that may come in handy one day. First up is a CMOS logic family AHC/AHCT that has one of the protection diodes on the input removed. This allows a 5V input voltage to be applied to a device powered by 3.3V so that I don’t have to add a gate just for the translation. Any time I can translate and do it without any additional gate delays I am a happy engineer. Of course the example above works in a single direction and bidirectional does start to get more complicated. 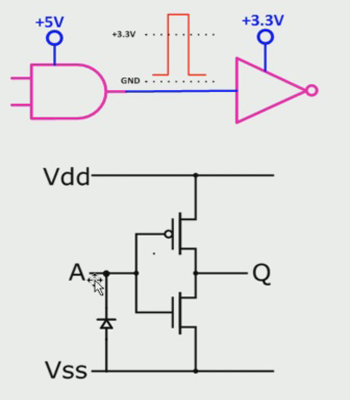 Using a bidirectional buffer such as a 74AHCT245 will work for TTL translation when going from 3.3V back to 5V providing there is a direction control signal present.